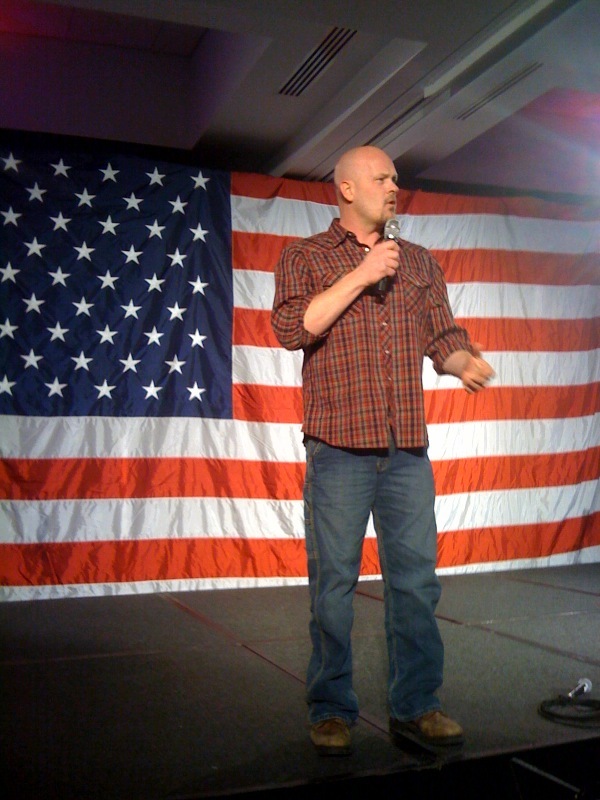 Joe the Plumber (aka Samuel J.Wurzelbacher) headlined state Representative Sam Rohrer’s Mobilize for Liberty event in Harrisburg today, giving the Berks County lawmaker his support a few hours after Rohrer mustered just a dozen votes in the State Republican Committee’s gubernatorial endorsement meeting. Joe’s endorsement is apparently quite the coup. He says more than 200 politicians have asked for support this year, but so far, he’s only backed five. “I need to talk to candidates before I endorse,” he told me afterwards, explaining that his bar is pretty high. “We have a series of conversations – 20 to 30 minute conversations – and I grill them. I ask them questions about energy, education – make sure they’re straight.” Wurzelbacher says he also vets candidates online. Wurzelbacher touched on several different points during his speech, and many of them were surprising. He said he doesn’t support Sarah Palin anymore. Why? Because she’s backing John McCain’s re-election effort. “John McCain is no public servant,” he told the room, calling the 2008 Republican nominee a career politician. So why’s he still milking the Joe the Plumber image, appearing at conservative events across the country? Wurzelbacher says it’s his duty to take advantage of the platform he’s been given. He wants to talk up the issues he cares about, and encourage the grassroots tea party movement. There are two contrasting events underway at the Harrisburg Hilton right now. In one ballroom, members of the State Republican Committee are voting to endorse candidates in the Senate, gubernatorial and lieutenant governor primaries. Most are well-dressed. All are what you’d call party insiders – members of county Republican committees, elected officials, major donors. They’ve just voted overwhelmingly to endorse Tom Corbett’s campaign, with only a dozen of the 348 voters supporting Sam Rohrer. But a few paces down the hall, a few hundred people in jeans, boots, field jackets and baseball caps are taking part I Rohrer’s “Mobilize for Liberty” rally. Judging by the signs they were holding in the lobby, the majority of them are against an official party endorsement. “They want to choose for themselves, and don’t like the fact that kingmakers and power brokers…are trying to force people out of the race before petitions are filed,” is how state Representative Daryl Metcalfe put it. The State Committee meeting began the morning with a roll call vote on whether or not to offer an endorsement. Members voted by overwhelming margins – 300-47, 297-51 and 213-135, in the Senate, gubernatorial and L-G races, respectively – to go ahead and make official selections. After the balloting was done, Chairman Rob Gleason warned party members to fall in line behind the endorsed candidates. “Rebelling against our party’s decision may sound romantic, but it will hurt the nominee and the party in the long run,” he said. Good evening. It’s not the Olympic Opening Ceremonies — but Pennsylvania’s Republican State Committee meets tonight and tomorrow to endorse candidates in this spring’s statewide primaries. Gubernatorial and Senate candidates will participate in a forum tonight, and I’ll be live-blogging the events. 8:19 Not too many details about that reform plan from Corbett. He says he’ll fill in the specifics later, but then spoke broadly about making lawmakers accountable for the line-item details of their per-diems. Both Corbett and Rohrer said Pennsylvania shouldn’t have accepted federal stimulus dollars — though Corbett acknowledged that, in reality, Pennsylvania didn’t really have much say in the matter. Rohrer knocked Corbett a bit for suggesting CareerLink should be expanded, saying the state doesn’t need any new programs. 7:52 And…that’s it! A short debate. Off to question the candidates. More updates to come. 7:48 Question 2: What’s your plan to reign in spending? What programs would you cut? “Saying no to federal money and cutting strings that require us to spend federal money,” another idea, he says. 7:45 Rohrer — people don’t leave the state because they don’t like it here. They leave because there are no jobs, or because the cost of living is too high in Pennsylvania. … Why are there no jobs? Lists “a hostile business climate.” Labor climate — “fact is, more of our business has gone down south because of labor climate,” more than taxes. 7:42 First Youtube question — how would you keep young workers in PA? 7:39 Now it’s Corbett’s turn. “The same message I’ve recieved — Pennsylvania has seen better times, but it’s struggling.” Mentions decline of “stimulus money we should never have taken in the first place,” pension fund, and other financial issues. His agenda? “J-O-B-S.” Fiscal discipline, limited government and free enterprise” would do that, he says. Says employees shouldn’t be forced to join a union or pay union dues. Rendell “puts its hand out” to the federal government “at every turn.” State needs to be more financially independent. 7:25 The gubernatorial forum is about to begin. Each candidate will get one question submitted via Youtube. 7:21 Perry called up to stage to receive the GOP’s Leadership Award (it’s a Reagan bust), as well as a personal letter from former President George W. Bush. Perry is a a Lt. Colonel in the Pennsylvania National Guard’s 28th Combat Aviation Brigade. Perry piloted helicopters and oversaw logistics during the recent tour in southern Iraq. 7:01: People filing into the ballroom. A big band is jazzing up the room. Sounds like the format will be a four-minute opening statement from each candidate, followed by two rounds of questions. (Harrisburg) — Governor Rendell’s proposed 2010-11 budget would increase state spending by four percent, to 29 billion dollars. Delivering his eighth and final budget address in the face of a still-shaky economy and a projected 525 million dollar revenue shortfall, Governor Rendell characterized this year’s spending plan as “status quo,” arguing there’s not spending left to eliminate, after last year. Rendell said he’s proposing level or slightly reduced spending in most departments, with notable exceptions for welfare, corrections and education – all of which would see budget increases. During his speech Rendell urged lawmakers to pass the budget by the June 30th deadline for the first time in his administration, referencing last year’s 101-day impasse. Senate President Pro Tem Joe Scarnati agreed with the sentiment, and singled out the Department of Public Welfare, corrections and pensions funds as areas where those spending efficiencies could be identified. The most high-profile “new” idea to come from the budget address is a proposal to reduce Pennsylvania’s sales tax from six to four percent, but widen its base by applying the levy to 74 currently exempt items, including newspapers, magazines, candy, gum and basic television bills. Rendell said the present system of loopholes doesn’t make sense. Scarnati called the proposal a tax increase, and says it would be “dead on arrival” in the upper chamber. Rendell said the shift would generate 531 million dollars. He wants to set that and other new revenue aside in a special fund the state couldn’t tap into until federal stimulus dollars expire in 2011. The reserve account would also include money from proposed taxes on smokeless tobacco, cigars and natural gas drilling. The sales tax idea – lowering the rate but broadening the base – sounded pretty familiar to Berks County Republican Sam Rohrer, who’s running for governor. Rohrer has pushed a similar concept for years in the House. Rendell also repeated his recent call for reform, urging lawmakers to pass a campaign contribution limit, and begin working on a merit selection system for judicial appointments.